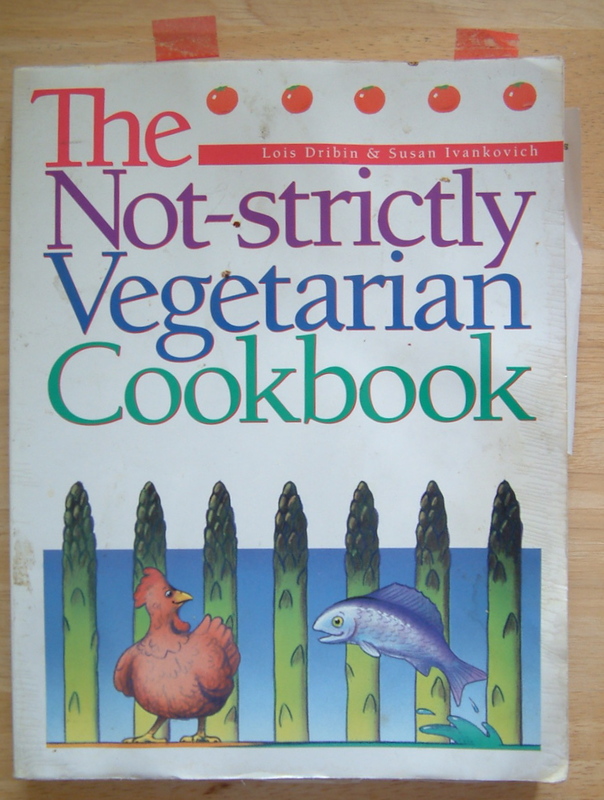 The very first cookbook I bought was “The Not-strictly Vegetarian Cookbook” by Lois Dribin and Susan Ivankovich. It features a lot of easy to make vegetarian dishes (Lasagna with Tofu and Spinach is a surprising favorite) along with some fish and poultry. The authors also encourage using sweetners other than sugar, such as maple syrup or apple sauce, when making desserts. The paperback cookbook is handwritten with folksy pen-and-ink drawings. It had just the right tone to encourage a recent college graduate to start an adventure in home cooking. Do you have a favorite cookbook that you find yourself returning to over and over again? Let me know about it! She’s actually one of my favorite cookbook authors period as I have almost all of her recent baking books and have tried dozens of recipes from them, almost all of which have turned out really well. This particular one is arranged by flavor (as the title indicates): almond, apricot, banana, blueberry, butter, coconut, coffee and mocha, cinnamon, chocolate, lemon, peanut butter and more. There aren’t enough pictures to satisfy me (bear in mind I love cookbooks that have a picture for every recipe) but what there are are just mouth-watering. The directions are easy to follow and I’ve gotten some of my favorite recipes from this book. I have cookbooks that I keep around for pure nostalgia: Laurel’s Kitchen, Moosewood/Broccoli Forest/Still Life with Menu. And then cookbooks that I just like to read, even if I don’t cook from them much (Living More With Less Cookbook by Doris Janzen Longacre). For me, it’s a tie between “Easy Vegetarian” by Tessa Bramley, Ursula Ferrigno and a few others and “The Art of Simple Food” by Alice Waters. I don’t think I could survive without either of them! Well, I’m using cookbooks more for inspiration here and there. Not sticking to one always. Laurel’s Kitchen Bread Book has been extremely useful (following most closely for how to and recipes), then Joy of Cooking, of course (for reference and ideas), and for more ideas Twelve Months of Monastery Soups international favorites by brother Victor-Antoine D’Avila-Latourrette. Many others just for fun. I also get recipes from Cookinglight.com and occasionally from the Food Network. I’m a 25+ years professional culinarian and probably have over 250 cookbooks. I use them for reference, for ideas, for inspiration. Madeleine Kamman is one of my mentors so I really like her writing. “The Making of a Cook” is a Bible to me. The Sharon Tyler Herbst (RIP) book, “Food Lover’s Companion” third edition (I have had multiple copies of all 3 editions and I believe there is a 4th)…is the most used book I own. I love the writing of Thomas Keller and Anthony Bourdain so I have their books. Their recipes aren’t for everybody however. I love and respect Alice Waters and have most of her books and really like Terry Walter’s book “Clean Food”. I have collections of books like the Time/Life collection of “Foods of the World” which was printed back in the 70’s I believe…28 or 29 volumes from cuisines around the world. So much great historical information about food. Recently I have been collecting books published by Phaidon like “The Silver Spoon” and “A Day at elBulli” and books in the Culinaria collection which highlights the cusines of different countries of the world. If you haven’t read “In Defense of Food” by Michael Pollan you need to because it will change what you eat and how you eat.